This is such a family favorite that I always have one of these pies in my freezer. Although most recipes for this classic dish call for chopped spinach, I prefer the whole leaf because it has a superior texture and I think the quality of the spinach is better. Squeeze as much water out of the spinach as possible and set it aside. Heat the olive oil in a sauté pan over medium heat, add the onion, and cook for 2 to 3 minutes or until softened. Stir in the spinach and mix well. Remove the pan from the heat and add the eggs, feta cheese, Parmesan cheese, dill, and pepper to taste. Place in an 8- or 9-inch-square cake pan or a rectangular baking dish. Place one phyllo sheet on top of the spinach mixture (tuck edges under if needed). Brush with some of the melted butter. Repeat with remaining phyllo and butter. For a change, use thawed frozen puff pastry (trim the dough to fit the top of the baking pan). Brush the pastry with an egg wash (one egg with 2 teaspoons water) rather than the melted butter. Culinate editor's note: This pie is basically greens and cheese baked with a top crust. 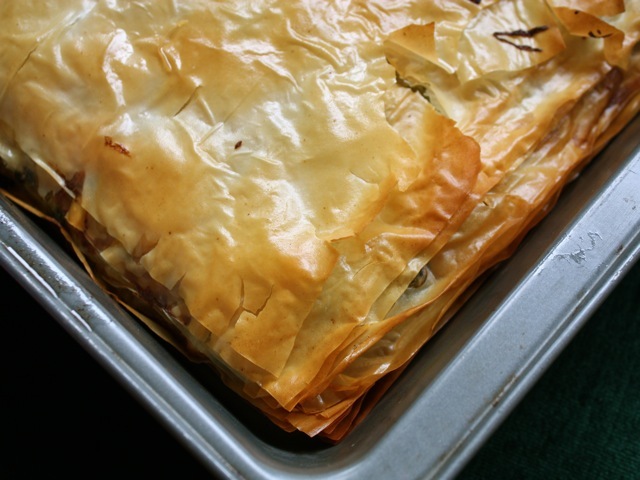 For a more classic (and larger) spanakopita, try Culinate recipe editor Carrie Floyd's version. Read Ronnie Fein's [mix/dinner_guest?author=8860 posts] on the Dinner Guest blog.